Hello and welcome. I hope you have all had a great week so far. 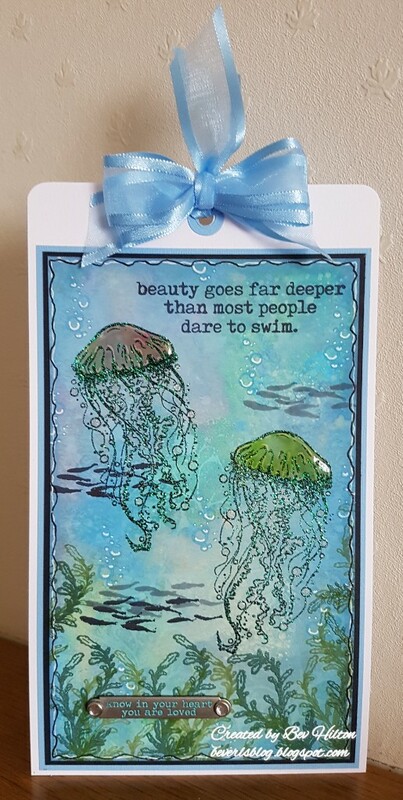 Today I am sharing a nice and easy tag made with the awesome stamp set from Visible image called Dare to Swim. Visible Image stamp set...Dare to swim. Distress oxide inks...Salty Ocean, Broken China, Cracked Pistachio, Picked Raspberries and Fossilized Amber. Cosmic Shimmer...Aurora Crystal Sparkle embossing powder. Stampin Up Ink Pad...Black and Mossy Meadow. PaperArtsy fresco finish chalk paint...Bora Bora. I began by pressing the cracked pistachio and salty ocean onto my craft sheet and spritzing with water. I swooshed the card over to pick up the inks. Dry this with a heat tool. Continue adding the inks to the craft sheet and spritzing with water, dabbing areas of the card into the ink. Keep drying as you go. Continue until happy with the look. Next is a technique which I love with these inks. Take the stencil and spritz with water. Have some paper towel handy as you will need to make sure the sides of the stencil are wiped dry. Place it directly down onto your card dabbing it straight away to take up any excess water. Lift up the stencil and dab up any blotches and then blast with a heat tool. This now gives a subtle faded print of the stencil. Take the jellyfish and using the stamp platform and versafine onyx black ink pad, stamp the jellyfish in the top left and repeat stamp two or three times to get a good print that is wet enough to take the Cosmic Shimmer crystal sparkle powder. Once sprinkled on, gently heat from the back of the card until all melted. Repeat this with the second jellyfish. I already had a mask cut for this jellyfish from a previous project so used this to cover the image while stamping the shoal of fish in both black ink and also the watering can ink to give the appearance of depth. Take the wording and stamp this at the top of the tag. My preferred ink when stamping over distress oxides is Stampin up ink as it's so juicy and stamps over very well. Now take the seaweed and stamp this across the bottom using fern green and then add a couple with the mossy meadow, add clear embossing powder and heat set. Make sure before you do this to dust over with an anti static pad to ensure the powder doesn't stick to other areas. Take the bubbles stamp and stamp them randomly over the card with the broken china distress ink. Highlight the bubbles with the white signo pen. 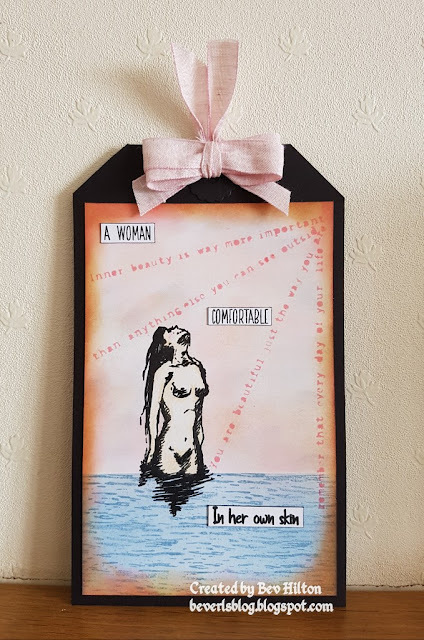 Doodle a border round the card using a black posca pen and then go round the edge again in the same way using the white signo pen. Add some wink of stella to the circles on the tentacles of the jellyfish to give a soft sparkle.Take the word band and rub over the wording with the Bora Bora to make it pop. Add this to the card and glue on a gem each side. Mount the card onto a piece of black card. Mount onto some blue matching card before mounting onto a piece of white card, leaving an inch at the top to punch a hole for the matching ribbon. Die cut two hole reinforcements and glue in place. Add the ribbon and bow. 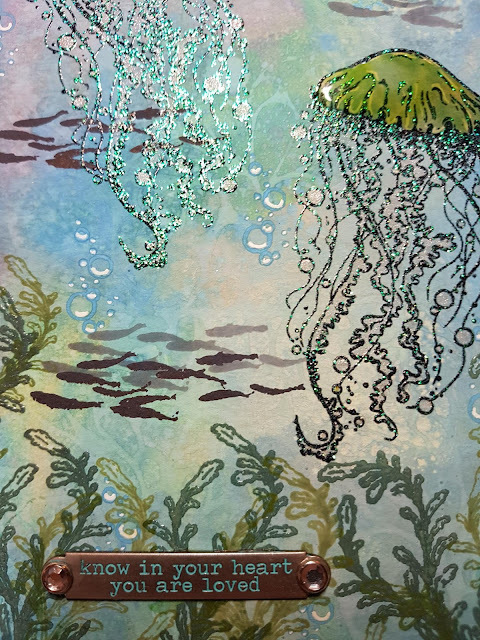 Now the tag is made, add the glossy accents to the jellyfish and leave overnight to dry thoroughly, making sure it is lying flat so that the glossy accents level out with a smooth finish. All for now and thank you for dropping by. Have a fabulous bank holiday weekend and hope to see you again soon. painted them , dear .It is a gorgeous tag, I love it ! !